Sonic performing a series of Homing Attacks to take out Bubbles in Sonic 4 Episode I. The Homing Attack is a special move principally used by Sonic the Hedgehog that allows the character to swerve during a spin jump, automatically zeroing in and striking a nearby enemy. It was first featured in Sonic 3D: Flickies' Island, where the instruction manual called it the Sonic Blast AttackMedia:Sonic3D Sat EU manual.pdf; not an intrinsic ability of Sonic at this point, it required the Gold Shield power-up to use. The technique became a standard move in Sonic Adventure and has been included in all 3D and several 2D Sonic games since. In Sonic Heroes, it was part of the repertoire of all Speed type characters, so other users include Amy Rose, Shadow the Hedgehog, and Espio the Chameleon. 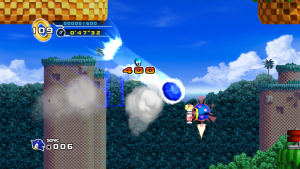 Usually activated by pressing in mid-jump; if no enemies are within range, use this move to have Sonic perform a Jump Dash (in Sonic 3D Blast, Sonic would instead go straight down). In this way it often replaces Sonic's earlier double-tap jumping move, the Insta-Shield. In Sonic Lost World, Sonic is capable of performing a Focused Homing Attack, which is capable of locking-on to multiple enemies; up to six at once. The more enemies Sonic takes out with a single Focused Homing Attack, the more Animals will be rescued than just defeating each enemy individually, with the second enemy destroyed releasing two animals, the third releasing three, and so on. This type of Homing Attack can also work on just one foe; if three layers of reticles appear on a certain enemy, the player can release the Focused Homing Attack to deal even more damage and possibly defeat the foe immediately. No bosses, excluding the first fight with Zazz, will be defeated easily with this method, but it is very effective against them. The Homing Attack first appeared here, but requires the Gold Shield. Simply press or when jumping near an enemy. Press / / Spacebar during a jump or fall in Speed formation. When in Power formation, the Speed and Fly characters will automatically attack nearby enemies. Press when jumping near an enemy. Cannot be used on springs and rails. Press / during a jump. Press when jumping near an enemy. Press / in the Xbox 360 / PlayStation 3 versions during a jump. In the Wii / PlayStation 2 versions, press / . Press / during a jump when you see a reticle on an enemy. Note that in Sonic Generations, Classic Sonic can unlock the Homing Attack as a Skill by collecting all of the Red Star Rings in Planet Wisp Act 1. In the 3DS version, the Homing Attack is part of his default moveset and is automatically unlocked after defeating Big Arms. Press during a jump when you see a reticle on one or more enemies. For certain targets, wait until more reticles appear on it to perform a Focused Homing Attack. Custom 1: Stomp. Instead of moving towards a target, Sonic goes straight down, meteor smashing the opponent. Custom 2: Surprise Attack. A faster variant of the Homing Attack, albeit with less power and range. This page was last edited on 4 May 2018, at 07:06.